I'm an adult with supposed "high functioning" autism. I drive my own car, and for the most part, I have many self help skills. There is nothing obviously different about the way I speak. I also work as a therapist, with young autistic children. Due to the nature of my job, I am required to get a tuberculuosis (TB) test every year. The test involves a needle, and I've had a severe phobia of needles for as long as I can remember. To be perfectly honest, I've always had a general phobia when it comes to medical procedures, even the painless ones. So, when it came time for my yearly test, my supervisor accompanied me to provide extra support. She and I have been close for several years and she has been there to support me in many other ways, even before my employment. In the waiting room for my test, she tried to distract me with pleasant conversation. I was starting to feel scared, so I only gave short answers and never returned any questions. When they called my name, I slowly walked into the room, feeling even more scared than before. I began to sweat and felt tears coming, despite the fact that the needle hadn't even been presented yet. Eventually, I was instructed to sit in a chair to get the injection. At this point, I realized I wasn't going to get out of the test, and that I actually had to do it. I began hitting myself and yelling, to further delay the process. I plopped down into the chair, only to intentionally fall out of it a few seconds later. I landed on my knees and began to cry. I hit my supervisor and then began pulling on her arms. I felt like I couldn't speak or even breathe. Like I was literally drowning in my own fear. I was a hyperventilating, crying mess on the floor. My supervisor took my hands, encouraging me to breathe slowly and use words to communicate. I was eventually able to sit back in the chair, and was even able to express that I didn't think I would be able to keep my arms still. I asked the nurse to hold my entire arm while she did the test and my supervisor to hold my other hand. It was over in less than five seconds, and somewhere in my head, I had known that'd be the case. So if I'm so "high functioning," why do I still engage in these harmful behaviors? 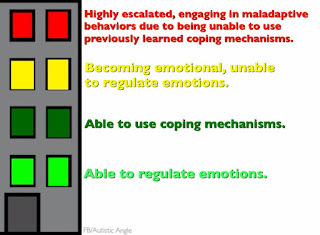 An individual with autism, like me, may have mastered many coping skills and emotional regulation techniques, however, when highly escalated, these skills can be difficult for us to access. It's like being on the 100th floor of a building with only stairs and needing to sign an important document. The problem is, all the pens are on the first floor. You know you need a pen, and you know how to use one, but when you're up at the top, it's difficult for you the access the pen and therefore, the skill of using it. [image: a simplified illustration of a four-story building. reading, "Able to regulate emotions." text reading, "Able to use coping mechanisms." 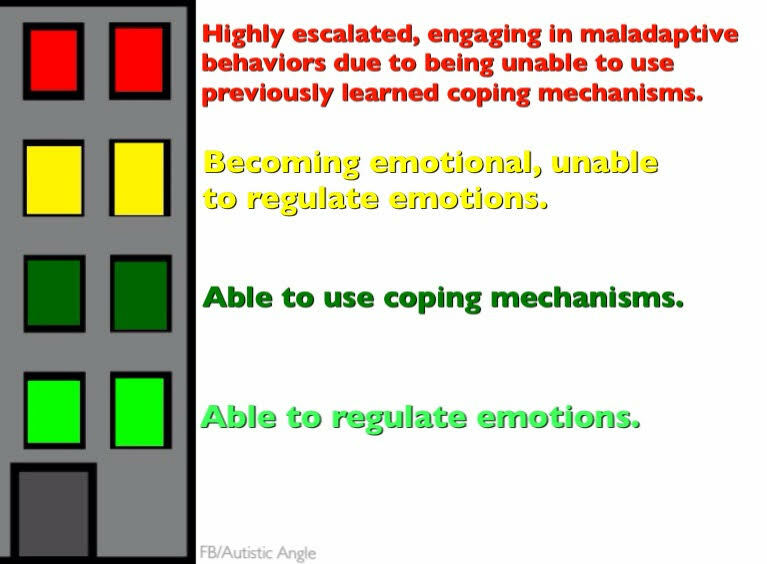 Sometimes, when an autistic individual becomes highly escalated, we may engage in maladaptive behaviors such as, self injury, aggression, or elopement. Even though we may have verbal or other communication abilities, we may have a hard time accessing them due to being so highly escalated. Rather than hitting myself or my supervisor, I could've asked the nurse to give me a minute, in order to delay it so I could take a few deep breaths. Instead of falling on the floor, I could've stayed in my chair. However, I was in such an escalated emotional state that I couldn't access those skills at that moment. Autism doesn't go away when a person turns 18, autistic individuals will need ongoing support in some way, at certain points. And "high functioning" doesn't mean a person doesn't need support. Autism affects everyone differently, and it's OK to need extra help with certain things. I'm very fortunate to have an understanding employer and a supervisor who cares so much about me. I hope that someday, autism services that include highly trained and understanding individuals are available to all who need them.